Some time ago I did a road trip around New Zealand's stunning East Cape with my young sons (HERE), in preparation for that trip and whilst trying to pack what was clearly too much gear in to my current bag it slowly dawned on me that I should start to look seriously at alternatives. I've always found bag choices to be quite tricky, in essence, no matter how much research you do, the only way you'll ever know if a bag is going to work for you is to try it yourself. That said, on this occasion I did something I have not previously done, I put the question out there to other togs to see what recommendations came back, of course when you do something like this it can serve to further complicate matters! Reading through the responses all the usual suspects where there as one would expect, bags I'd either already dismissed and others that I was in some way considering. 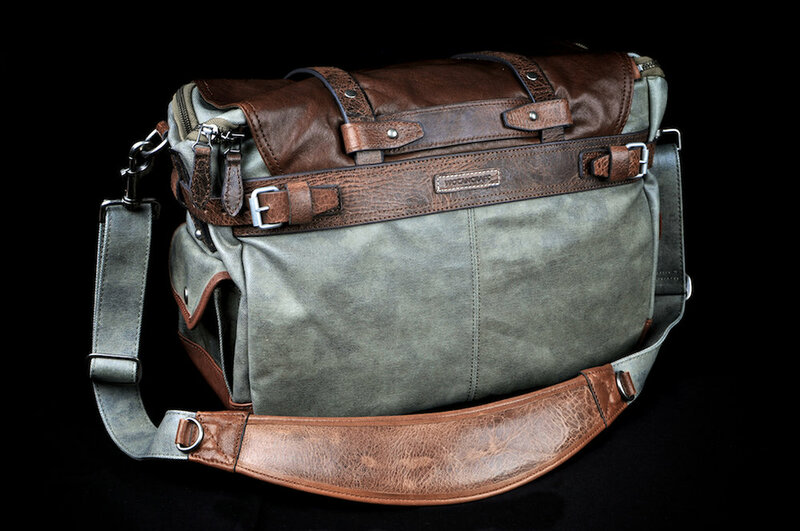 Then I had a recommendation from a friend, Stephen Patterson regarding a bag I was much less familiar with, enter the Wotancraft - City Explorer 002 Ranger. Whats immediately evident to me upon opening the packaging box is attention to detail, this bag doesn't ship wrapped in plastic, it arrives in a purpose made cotton, dust-proof holdall. Does it make it a better bag? of course not, but it does set a tone of quality, one which is evident throughout all aspects of the bag, someone has really thought this through, what's more that someone has a lot of pride in their product. It's probably the most stylish bag I've owned, with the City Explorer 002 Ranger WOTANCRAFT have gone for genuine retro styling with subtle military tones, to be honest whilst the styling is probably very important to some it's less so to me, what I really want is a bag thats well made, functional and above all big enough to cover any eventuality. It will come as no surprise to know it has all these bases covered. Handmade by Artisans using "2nd Hand" techniques is how WOTANCRAFT describe the finishing of the City Explorer 002 Ranger, "old but new" is another phrase used to characterise it's look and feel. I'm reminded of a pair of Levi's 501's I bought in the late 80's they were new but had been artificially aged, I was very attached to those jeans and I suspect I will be equally fond of this bag!! With each bag being handmade the finish is therefore distinctly original, one of a kind and as such exclusive to you!! Reassuringly the bag is fitted with branded YKK zippers, the metallic elements such as the catches, buckles and loops also appear to be of excellent quality although time will be the real measure of that. I recall an extract from the WOTANCRAFT website, "quality is everything, only the best, no compromise" easy to write I know, but to be fair everything I've seen so far on this bag echoes those sentiments. Let's not forget the fun little touches like the "Remove Before Adventure" key fob pictured above, maybe there are other uses for this? With two storage pouches to the front of the bag and one at either end there is plenty of "easy access" external storage, I've used these for my light meter, white/grey cards, blower brush, 120 film, compact digital camera (Leica D-Lux 4 in my case) that kind of thing. Along with these there is also a zipped pouch suitable for an iPad or similar sized device. The bag is available in a choice of two colour combinations, Army Green & Russet Brown which I selected and Navy Gray & Dark Brown. As it happens either of these combinations would have suited my tastes, I'm not sure on the possibilities of a two tone brown bag in future but this would also have appealed to me. Without hesitation, this is the element of the bags design that most impressed me when I began my research, the removable inner bag or to use its official name, the X-TECH WELD INNER BAG MK-II. Yes, this inner boasts an almost 100% waterproof quality thanks to its construction from Military Grade Hovercraft materials no less. Complete with a YKK Water Repellant Zipper which I'm guessing is the reason for this being "almost" 100% waterproof, still thats "almost" 100% better than my current bag!! There have been at least three occasions over the past 12 months when I could have used this feature and at least one when I desperately needed it, crossing a river in the East Cape on a wooden pallet tied to four oil drums whilst carrying a Leica M9, M6, M3 a 35mm Cron & 50mm Lux was perhaps not the smartest decision I ever made. As you'd expect the inner is lined with microfibre and comes with fully adjustable dividers so you can arrange the interior to suit your exact requirements. The clear plastic accessory pocket also velcro's neatly to the inside of the inner's lid, as this is folded back when the bag is in normal use its accessed with ease, seal up the inner and your memory cards and other accessories are protected along with your cameras. Most lens manufacturers supply you with a pouch for your precious glass, or as is the case with Leica a leather case, I want to transport my lenses in these for added protection, with this bag I'm able to do this easily. Whats more I'm able to get three rangefinders and 3-4 lenses in with minimal effort, more even, if I ever wanted! On the inside of the bag, there are also two small pouches suitable for business cards and similar sized items, additionally three pen sized holders and more importantly a pouch capable of holding a 13" Notebook (see my MacBook Air in the image below) All of these are incorporated into the bags material lining but still easily accessible when the X-TECH WELD INNER BAG MK-II is in place. One particular feature of the bag which I have found useful is the adjustable top straps, these allow you to hold in place a jacket or coat, there have been numerous occasions when I have walked the streets wishing I could easily loose a layer or two of clothing. In addition to the useful top straps on the underside of the bag you will find two more, these allow you to carry a tripod or additional item of clothing. In fairness, whilst I have attached my tripod I have not carried it around, I have a fairly heavy Manfrotto and I would certainly want a more lightweight unit suitable for carrying around all day if I was going to make regular use of this feature. Another real surprise has been the curved leather shoulder pad, its incredibly comfortable, despite the obvious weight of a full bag it seems to distribute it incredibly well. Invariably I would have to swap shoulders with my smaller bag as it gradually became more uncomfortable, but as yet I have not found the need to do this with the WOTANCRAFT City Explorer 002 Ranger. It would be remiss of me not to mention the weight of the bag, at a little over 2kg when empty its twice that of my previous bag but it's also twice the size!! And given what I've mentioned above about the weight distribution and strap comfort it most certainly isn't noticeable to me. Ultimately I need a bag capable of carrying the equipment I need on the occasions that I need it. A couple of well used combinations, as you can see there is no shortage of space in this bag. Without doubt I would describe this as a "premium" bag, I fully intend to update this post with anything I subsequently note about the bag and its performance but there comes a time when you have to document your thoughts and commit them to writing, I've had just over two weeks using the bag, certainly enough time to get the measure of it. As photographers we spend thousands, sometimes tens of thousands of dollars on equipment, having done this isn't it only sensible to invest in the best bag you can find?? One thats going to protect your equipment and make photographing on the move as easy as it can be. I'd go so far as to say that I'm so thoroughly impressed with this bag that I will definitely be looking to Wotancraft for a smaller bag option, I'll keep you posted on that.